The sale of the OnePlus 3 is started. Unlike before you don’t need an Invite for the purchase of smartphones. Network World suggests you when, where and how you can buy the OnePlus 3. The OnePlus 3 can be ordered directly in the online shop of the Chinese producer on OnePlus.net. Currently you can select only the color "Graphite". When the OnePlus 3 can be ordered in "Soft Gold" is unclear. The price: 399 euros. The delivery time is currently seven days. The Chinese online store Oppomart.com leads the OnePlus 3. The seller shipped worldwide and with the "EU Expedited Shipping". You can pay via credit card or PayPal. With just under 395 euros, the OnePlus 3 is slightly cheaper than the OnePlus merchant. The online store GearBest.com also offers the OnePlus 3 for pre-order and will be delivered the first copies in July. But you can save compared to buying at OnePlus. 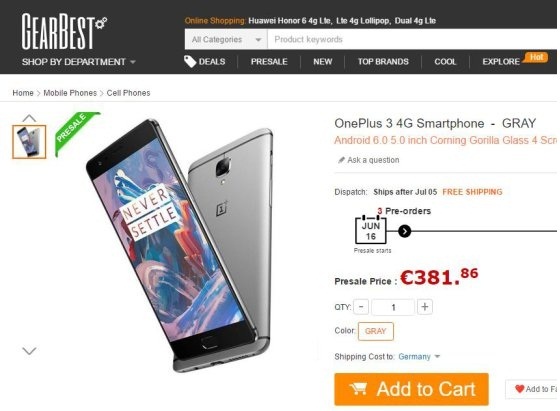 GearBest offers smartphone currently for 381.86 Euro. Whether it is the Chinese or international version is unclear. Is OnePlus 3 available for purchase on Amazon? Also OnePlus sells its smartphone via Amazon in some countries - including India and England. Here the smartphone is significantly more expensive than in the online shop of OnePlus. The OnePlus 3 is also offered by traders on online store eBay - but also at much higher price. Compared to purchase from OnePlus, the commission will be partly up to 100 euros.